Date based rules are a type of rule available for use in AutomateWoo workflows. These rules are a powerful way to segment your workflows based on the date something happened or will happen. Each date based rule is based on a specific date field such as a customer’s first order paid date or a subscription’s next payment date. All dates are considered to be in the site’s chosen timezone. There are several comparison types available with date based rules with each significantly changing how the rule will function. The possible comparison types will vary based on whether past or future comparisons are possible. 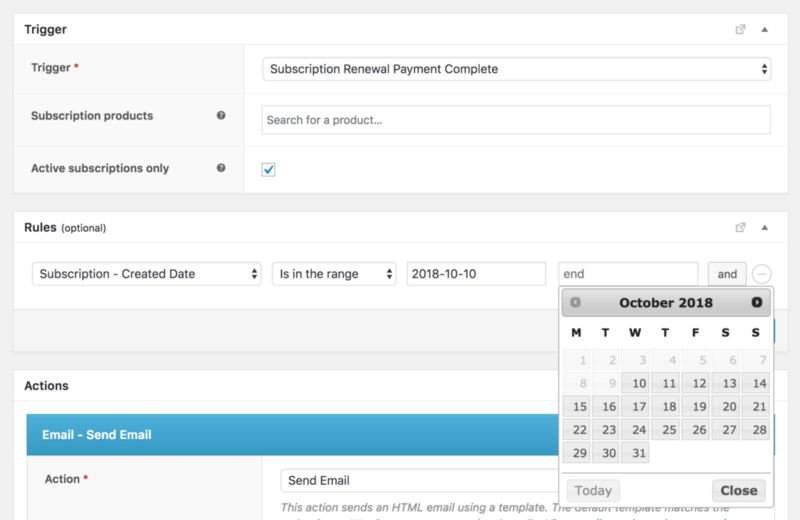 For example, the customer’s last order date can only be in the past but a subscription’s next payment date will always be a future date. A subscription’s end date could be either in the future or in the past! Determines whether the given date is within a certain period of time from now in the future. E.g the subscription next payment date within the next 7 days. Determines whether the given date is not within a certain period of time from now in the future. E.g the subscription end date BOT in the next 12 hours. Determines whether the given date was within a certain period of time from now in the past. E.g the customer’s last paid order date was in the last 7 days. Determines whether the given date was not within a certain period of time from now in the past. E.g the subscription creation date was in the last 6 hours. Determines whether the given date happens after a selected date. This comparison does not include the selected date. Therefore, selecting July 1, 2018 will mean the rule is valid for dates on July 2, 2018 and anything after. Determines whether the given date happened before a selected date. This comparison does not include the selected date. Therefore, selecting July 1, 2018 will mean the rule is valid for dates on June 30, 2018 and before. Determines whether the given date matches a specific date. E.g. the customer’s last review date happened on March 1, 2018. Determines whether the given date does not match a specific date. E.g. the subscription end date is not set to March 1, 2018. Determines whether the given date is on a selected day/s of the week. E.g. the customer’s first order paid date was on a Saturday or Sunday. Determines whether the given date is in a selected date range. This comparison type includes the selected dates in the range. Therefore, selecting the range from May 10, 2018 to May 17, 2018 would mean the rule is valid for dates on both May 10, 2018 and May 17, 2018 and any date between.